Rolling around me like a dreamy cloud are acres of verdant vineyards, stretching as far back as the Brokeback mountain ranges on the horizon. The air seems to sparkle in the sunlight, you can almost breathe in the freshness. 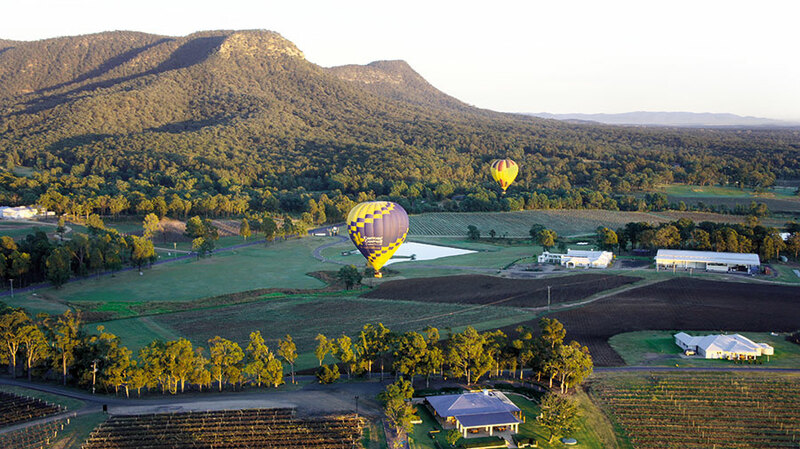 This is Australia’s wine country since 1828, Hunter Valley, a two-hour drive north from Sydney, in New South Wales. The country’s oldest wine-growing region is known for its fine dining, health spa resorts, galleries and golf courses. And of course the Hunter Valley Shiraz and Semillon wines. Nestled in its property among vineyards and bushland, the Spicers Vineyards Estate, in the Valley’s central Pokolbin area, proves to be a great place to stay at. The rooms sport a wood-burning fireplace that has me at first sight. As much perhaps as the hopping kangaroos rummaging in the undergrowth. This is an enchanting place and I am not surprised to discover that it is indeed a favourite wedding destination. The charm of the vineyards and the beautiful old eucalyptus gum trees all around and the pool at the back make it ideal. The wedding coordinator reveals that the hotel has won Trip Advisor’s Travelers’ Choice Award in the Hotels for Romance category in Australia, more than once. In the quietude and calm, I ask her, “Can you imagine an elephant or horse with groom astride, drums beating loud and Indian wedding music resounding in the silence?” A bright smile breaks over her face, “That would be so exciting,” she says. Spicers is just one of the area’s several estates that provide the perfect backdrop for an intimate wine destination wedding. Pick your preferred vintage from more than 150 cellar doors. Besides the Semillon, the wide variety of grapes include Shiraz, Chardonnay, Cabernet Sauvignon and Verdelho. The landscape is dotted with restaurants that dish up amazing food dependant on the fresh produce that is available right here. Lunch at Esca Bimbadgen, a restaurant with a long terrace, situated on a hill with vineyard views, looks to me like a perfect spot for some wedding-time socialising with family. The fresh modern cuisine highlights local produce and the Semillon washes down like a dream. Muse Kitchen (at Keith Tulloch Winery), which we visit on another day, serves up excellent sharing dishes, a great place for friends to catch up. Besides indulging in gourmet meals and touring vineyards, food lovers may enjoy a tasting of the artisanal products that the region is known for. We visit the Hunter Valley Smelly Cheese Shop for, well, a cheese tasting and are excited by their own as well as imported varieties. We tuck into some gelato, the perfect way to round up the cheesy afternoon. There is no dearth of venues here to take your marriage vows, I decide, as we greet the dawn the following day in the basket of a hot-air balloon. The balloon operator tells me of the couples who have tied the knot floating gently over the vineyards, with priest in tow. He also recalls one instance where a proposal was minutely planned, diamond ring and all, and the lady said no! Well, never mind that…. The adventurous, in their wedding finery, can ask for no better venue than the bobbing of a soaring basket and the perfect bird’s-eye views to inspire them for the rest of their lives. 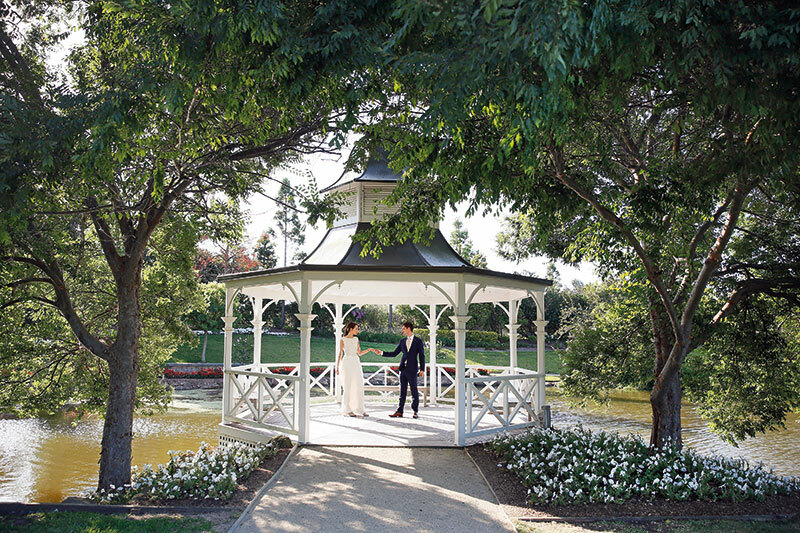 My search for wedding venues in this lovely land now takes me to the Hunter Valley Gardens (HVG) — over 60 acres of intricately manicured gardens surrounded by a boutique Shopping Village, an Irish pub and, of course, the vineyards. A walk around the eight kilometres of pathways through 10 spectacular, themed gardens would take all day and so we jump into the little train that conveniently chugs around. The couple may choose the spot that best suits their style and personality. The venue comes with an onsite wedding chapel and function centre. Hold the perfect ceremony in the Lake’s Walk Rotunda or at the top of a stunning waterfall. The Garden Terrace reception venue offers a picturesque setting overlooking the Oriental Garden. Drop from the skies via a helicopter or offer rides to the guests. End the magnificent day with an exclusive and unforgettable fireworks display. Or just quietly discover the Milky Way from a secluded bench. Star gazing is ever so perfect here! The changing seasons on this, the eastern coast of Australia, are a photographer’s dream. Summer is harvest time and the most vibrant part of the year. Autumn, with the vineyards slowly turning orange, is a visual delight. Winters are great for outdoor weddings and evenings by the fireside. Spring sees the vines spring back to life and by September the region is transformed into lush rolling hills. If the changing seasons do not excite, then choose to coincide your big day with one of the fine food and wine or horse racing carnivals. Or with a jazz, opera or rock concert in the vineyards. Not even that? Then just tee off at a championship golf course such as the Greg Norman-designed one, called Vintage, and impress your newly minted father-in-law…. A gesture that is certain to hold you in good stead later on.